Harvesting ramps has been illegal in Quebec for nearly 20 years -- which means there's now a black market in ramp smuggling. These sought-after alliums are the first forgeable to poke their slender leaves through the chilly soil each year. And like the first signs of spring after a long winter, these plants attract a lot of attention. Springing up from Georgia to Quebec, wild leeks, also known as wild garlic, wood leeks, ramps and ail des bois, are coveted throughout their range, spawning a full spring calendar worth of celebratory feeds and festivals dedicated to this smelly wild onion. However, although ramps have traditionally been an annual indicator of the changing seasons, reckless foraging and wanton consumption have all but destroyed wild growth in regions throughout their expansive range. Springing up from Georgia to Quebec, wild leeks, also known as wild garlic, wood leeks, ramps and ail des bois, are coveted throughout their range. Mary Ruth McDonald, research program director at the University of Guelph’s Department of Plant Agriculture says that on average patches of ramps increase in size by less than 10 percent a year. Therefore if more than 10 percent of the patch is picked it will not be able to come back the next year. Nowhere has the impact been more pronounced than in Quebec. In 1995 foraging of ramps for commercial purposes was banned in the province and the plant was listed as a vulnerable species. Under the ban, anyone caught with more than 50 bulbs is subject to a minimum $500 fine. In the past few years there have been several notable arrests of ramp smugglers caught red handed with hockey bags (oh, Canada) filled with freshly picked blubs. Although it may seem odd that someone would risk a hefty fine for a bushel of smelly bulbs, ramps can fetch over a dollar per plant in neighboring Ontario, where the plant is legal. This has created a veritable black market in bulb smuggling as thieves pillage ramp patches throughout Quebec and carry them across the border to legally sell them at markets and fairs for a handsome profit. There is a veritable black market in bulb smuggling as thieves pillage ramp patches throughout Quebec and carry them across the border to legally sell them at markets and fairs for a handsome profit. Quebec is not the only place to limit ramp harvesting. 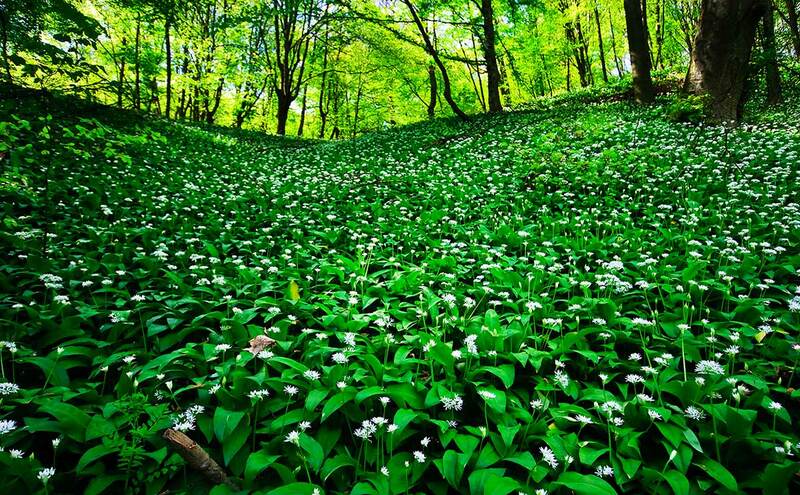 In 2004, parts of the Great Smoky Mountains National Park in North Carolina and Tennessee banned the harvest of ramps after a study found the only way to prevent damage to the patch was to harvest less than 10 percent each year. So unless you’re out digging around in the forest yourself, how can you tell if the ramps you’re buying at your local market were harvested sustainably? Simple answer: You can’t. However, Jacob Richler, a writer with Maclean’s magazine and self-proclaimed ramp enthusiast, says in his own rant against ramp destruction that as consumers you can do your best to only buy plants that look like they’ve been collected the right way. Look for mature bulbs with several wide green leaves that have obviously been cut from their roots. Make sure to avoid young sprouts with few leaves and their roots still attached. And if a Canadian man should sidle up to you in a dark alley with a hockey bag full of ramps and a deal too good to be true, just keep on walking.